Solar power is the conversion of sunlight into electricity, either directly using photovoltaics (PV), which convert light into electric current, or indirectly using concentrated solar power (CSP), which use lenses or mirrors and tracking systems to focus a large area of sunlight into a small beam. Solar power is one of the cleanest, most abundant forms of energy. 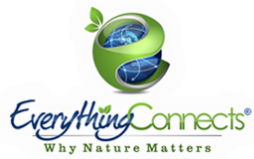 It emits zero greenhouse gases or other pollutants, uses no water, produces no waste and offers significant potential for short- and long-term climate change mitigation. Even though solar energy generation still only represents a small fraction of total energy comsumption, markets for solar technologies are growing rapidly, the cost of solar technologies have been significantly decreasing and technical advances and supportive public policies continue to offer the potential for additional cost reductions. 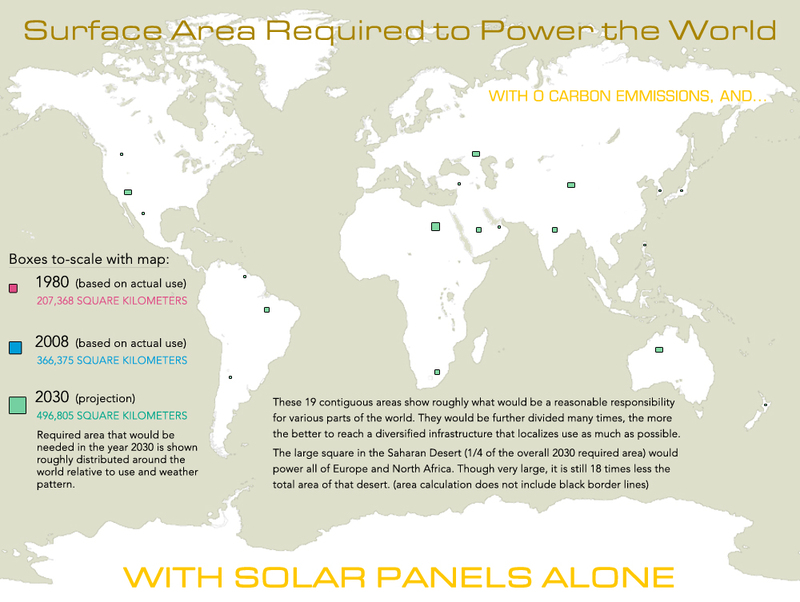 The rate at which solar energy is intercepted by the Earth is about 10,000 times greater than the rate at which humankind consumes energy and although not all countries are equally endowed with solar energy, a significant contribution to the energy mix from direct solar energy is possible for virtually every country. 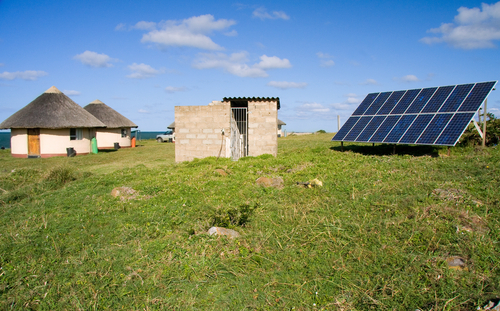 Solar energy conversion consists of a large family of different technologies capable of meeting a variety of energy service needs for both developing and developed countries. Solar technologies can deliver heat, cooling, natural lighting, electricity, and fuels for a host of applications, but without the pollution! Learn more. Sunlight is free, easily-accessible, inexhaustible! No mountain-tops have to be blown up or ocean floors dug up. Solar power uses no water. On the flip side, a typical 500-megawatt coal-fired power plant draws about 2.2 billion gallons of water each year from nearby water bodies and as much as 75 trillion gallons of water is wasted on dirty energy each year. Solar power produces no waste. A single coal plant, on the other hand, typically creates more than 125,000 tons of ash and 193,000 tons of sludge from the smokestack scrubber each year and produces other toxic substances, including arsenic, mercury, chromium, and cadmium, which can contaminate drinking water supplies, damage vital human organs and the nervous system and severely or permanently damage ecosystems. Learn more. Solar power can slash utility bills for both residential and commercial consumers. Organic farmers in New Jersey installed solar panels in a former pasture and saw their monthly electric bill plunge from $1,500 to $2 and with a surplus of more than 500 kilowatts going into their first winter with the system! Learn more. Solar energy conserves natural resources for future generations. With no moving parts, solar panels are silent, easy to operate and rarely require maintenance. Because solar systems are highly reliable, require little maintenance and are ideal in distant or isolated places, solar energy has been the power supply choice for many industrial applications. Learn more. Solar panels can help utilities avoid blackouts by generating extra energy when demand for electricity is high, such as in the summertime, rather than fire up expensive and polluting "peak" power plants that otherwise lie dormant. Solar power has the potential to create hundreds of thousands of American high-earning, high-tech green jobs that don't pose the type of toxic, dangerous environments coal miners face. Learn more. Solar power helps retain energy independence by reducing our dependence on foreign fossil fuels, particularly from unstable regions in the world, such as the Middle East, which can cause dramatic and unpredictable energy price hikes. Solar power offers significant potential for near- and long-term climate change mitigation since it does not emit greenhouse gases, which trap more heat and warm the planet. On the contrary, the extraction and burning of fossil fuels is fueling global warming and causing climate change. Solar power is transforming the lives of millions, especially in developing countries where sunsets would usually mean unrelenting darkness until sunrise or whose only sources of energy or light, such as kerosene lamps or leaky stoves burning biomass and coal, was a major source of indoor air pollution. However, with solar power, from small lanterns to photovoltaic panels, more people can now safely and efficiently light up the dark either indoors or out and have clean, sustainable electricity to power their lives. Learn more. Where And How Can Solar Energy Be Used? Solar energy can be used anywhere the sun shines! Whether for residential areas, commercial buildings, industrial purposes, remote locations or for a variety of other applications, the power of the sun can be harnessed virtually anywhere and for a growing array of diverse purposes. Homeowners, farms and businesses across the country are installing solar water heaters and panels to reduce their electric bills. Solar energy is also frequently used for transportation signaling, such as offshore navigation buoys, lighthouses, aircraft warning light structures, and increasingly in road traffic warning signals and street lighting. From powering environmental monitoring equipment and corrosion protection systems for pipelines, well-heads, bridges, and other structures to pumping water in remote areas as part of a portable water supply system, solar energy has few bounds to it's growing utilization of the sun. Specialized solar water pumps can even be designed for submersible use or to float on open water and large-scale desalination plants can also be PV powered using an array of PV modules with battery storage. Learn more. Furthermore, solar power is transforming the lives of millions, especially in developing countries where sunsets would usually mean unrelenting darkness until sunrise or whose only sources of energy or light, such as kerosene lamps or leaky stoves burning biomass and coal, was a major source of indoor air pollution (see also). However, with solar power, from small lanterns to photovoltaic panels, more people can now safely and efficiently light up the dark either indoors or out and have clean, sustainable electricity to power their lives. Learn more. Discover SolarCity, the largest solar installer in the US, famous for not selling, but leasing solar systems for monthly payments that are designed to be lower than what customers currently pay for their utility. This allows for customers to get solar systems on their roofs without spending tens of thousands of dollars upfront. Three ways to bring solar to the masses. Organic farmers in New Jersey installed solar panels in a former pasture and saw their monthly electric bill plunge from $1,500 to $2 and with a surplus of more than 500 kilowatts going into their first winter with the system! The unsubsidized cost of renewable power produced from solar and wind energy will be no more expensive than that from oil, natural gas, and coal by the end of the decade (see also) and even less expensive thereafter. However, if you take into account the very real health and environmental damage from fossil fuels, wind and solar power is the least expensive energy sources worldwide. 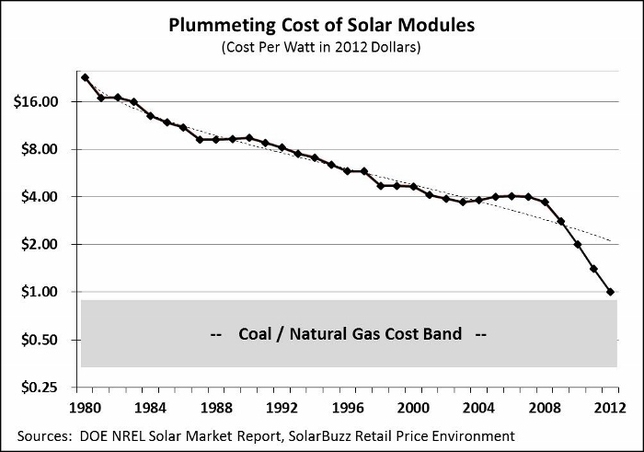 According to the Natural Resources Defense Council, "The cost of solar energy has fallen sharply over the last 20 years, with accelerating price declines in the last 5 years. Still, electricity from a concentrated solar power plant can cost about 10 to 14 cents per kilowatt-hour, compared with about 4 cents per kilowatt-hour from a coal or natural gas power plant, but these prices should continue to drop thanks to falling installation costs, accessible, low-cost, long-term financing, and a healthy number of incentives and tax packages offered by nearly every state government. The current federal incentives include a 30 percent investment tax credit (ITC) and a five-year modified accelerated cost recovery system (MACRS), which allows system owners to deduct federal taxes on an accelerated timetable of system value depreciation. Experts predict the cost of solar power will drop below retail electricity rates in many parts of the country between 2013 and 2018 and to about 5 cents per kilowatt-hour by 2020." In 2011, the International Energy Agency stated, "The development of affordable, inexhaustible and clean solar energy technologies will have huge longer-term benefits. It will increase countries’ energy security through reliance on an indigenous, inexhaustible and mostly import-independent resource, enhance sustainability, reduce pollution, lower the costs of mitigating climate change, and keep fossil fuel prices lower than otherwise. These advantages are global. Hence the additional costs of the incentives for early deployment should be considered learning investments; they must be wisely spent and need to be widely shared."